Trump Continues Attack On Harley-Davidson - Joe.My.God. 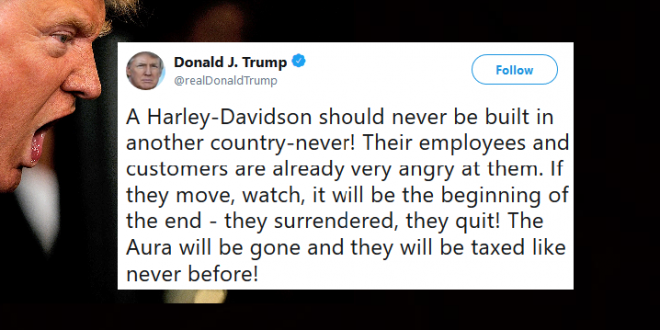 President Donald Trump said Tuesday that Harley-Davidson will be “taxed like never before” if they move production overseas, and that the U.S. motorcycle company was using increased trade tensions as an excuse to justify planned changes in manufacturing. On Monday, Harley said it was moving some production overseas due to increased costs from the EU’s retaliatory tariffs against the Trump administration’s duties on steel and aluminum from the bloc. No production will be moving to Europe as a result of the tariffs, according to the company. Harley’s overseas manufacturing plants are located in countries such as Brazil, India, Australia and Thailand.